Apple recently made some serious tweaks to its podcasts on the web. 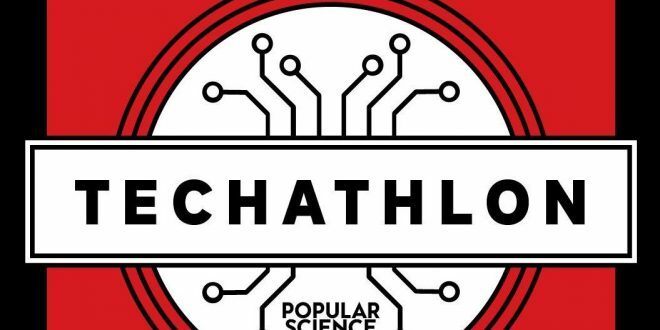 While listening used to require opening up lumbering dinosaur that is iTunes to enjoy the sweet sounds of Techathlon, you can now just hit this link and press play. Some reports say this is the beginning of the end for iTunes as the next version of macOS will have stand-alone Music and Podcast apps instead of roping it all into the unwieldy behemoth we’ve been using since the days of the iPod. Of course, you can get Techathlon outside of iTunes if you want. You can listen in the player above, follow on Anchor, subscribe via Stitcher, or add us on Spotify. And while you’re at it, be sure to join us on Twitter so you can brag about your scores or share your totally unfounded and probably-wrong Game of Thrones theories with no fear of judgment. (Tyrion is a ghost). Here’s what to expect from this week’s show. As always, we start the show with 10 questions to help us recap the week’s biggest tech news. This week, the subjects range from the increasingly confusing 5G landscape to new Android features. The competition is cutthroat, as always. Social media may seem like a wacky, lawless land built for debauchery, but there are rules. Some of these rules are obvious, while others only reveal themselves when you get up to no good trying to harass people or spam for followers. See how well you know the limits of the various platforms. Every year, gamers spend literally billions of dollars buying in-game digital objects to improve their experience or just spruce up the look of their digital avatars. A large chunk of that business comes from loot boxes—virtual crates full of random in-game items—which seems suspiciously like gambling. Now, the FTC is considering regulating this process, but the market for in-game items will likely thrive no matter what happens. In this game, we try to pin down the pricing on some of the most expensive digital items ever sold. Some of the prices are totally absurd. Alfred R. Jackson writes for Technology section in AmericaRichest.